SMMT is now open sourced under BSD-like license. Sourceforge page is here. There are two recent developments related to Augmented Reality and Google – Google Goggles and Google integrating QR codes into Google Maps. While I was talking on twitter with @noazark the question arise about Google Google not doing real-time localization of the user, thus not being a “real” AR. And well known marker-tracking technique easily applied to them. Marker tracking could be augmented (pan intended:) by planar tracking of the corners of the pattern itself. That allow for attaching virtual 3d objects/animations to QR codes, but there is more in it. As QR code contain more than 4k of data, exact GPS coordinate, pattern orientation and its’ size could be encoded in the pattern. That way mobile phone seeing the code can easily calculate it’s exact 3d coordinate and orientation, not only relatively to QR, but absolute. More of it – QR code can have coordinates of nearby QR codes, creating kind of localization grid, which can point user to any location covered by that grid with arrow on the screen of the phone. 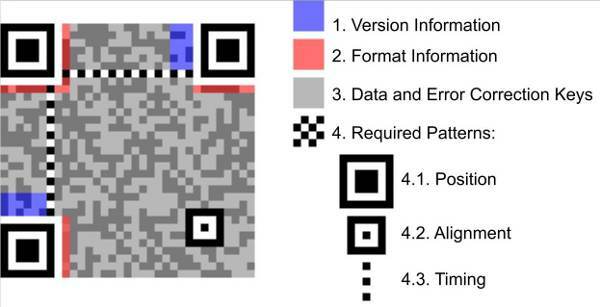 Now to markerless tracking – QR code can be used to jump-start markerless tracker and assist it with error-correction(drift compensation), especially mentioned grid of the codes. That is especially relevant to markereless trackers which use planar structures and straight edges. Now there is one problem here – white QR code is easy to segment out of dark background. But on white background it not so easy to recognize, and embedded fiduciary markers will not be seen form afar. Here is suggestion – make thick black frame around the QR, and make it part of the extended standard. This square shape would be easy to recognize, even if it’s only couple of dozen of pixel in diameter. With incremental tracking phone will be able to track it(after initial close up) even if moved quite far from the QR. If this square frame is part of the standard, always having the same relative size, it could be used for distance estimation. Now combine it with Google Goggles real time and you have functional AR with 3d registration. Demo-version of binary Symbian multimarker tracking library SMMT available for download. SMMT library is a SLAM multimarker tracker for Symbian. Library can work on Symbian S60 9.1 devices like Nokia N73 and Symbian 9.2 like Nokia N95, N82. It may also work on some other later versions. This version support only landscape 320×240 resolution for algorithmical reason – size used in the optimization. This is slightly more advanced version of the tracker used in AR Tower Defense game. I get viewfinder RGB bitmap, access it’s rgb data and use glTextureImage2D to upload it into background texture, which I stretch on the background rectangle. On top of the background rectangle I draw 3d models. PS Here is binary static library for multimarker tracking for S60 which use that method. Nokia camera example could be used the as the base. I often hear sentiments from users that they don’t like markers, and they are wondering, why there are so relatively few markerless AR around. First I want to say that there is no excuse for using markers in the static scene with immobile camera, or if desktop computer is used. Brute force methods for tracking like bundle adjustment and fundamental matrix are well developed and used for years and years in the computer vision and photogrammetry. However those methods in their original form could hardly produce acceptable frame rate on the mobile devices. From the other hand marker trackers on mobile devices could be made fast, stable and robust. So why markers are easy and markerless are not ? The problem is the structure , or “shape” of the points cloud generated by feature detector of the markerless tracker. The problem with structure is that depth coordinate of the points is not easily calculated. That is even more difficult because camera frame taken from mobile device have narrow baseline – frames taken form position close one to another, so “stereo” depth perception is quite rough. It is called structure from motion problem. In the case of the marker tracker all feature points of the markers are on the same plane, and that allow to calculate position of the camera (up to constant scale factor) from the single frame. Essentially, if all the points produced by detector are on the same plane, like for example from the pictures lying on the table, the problem of structure from motion goes away. Planar cloud of point is essentially the same as the set of markers – for example any four points could be considered as marker and the same algorithm could apply. Structure from motion problem is why there is no easy step from “planar only” tracker to real 3d markerless tracker. However not everything is so bad for mobile markerless tracker. If tracking environment is indoor, or cityscape there is a lot of rectangles, parallel lines and other planar structures around. Those could be used as initial approximation for one the of structure from motion algorithm, or/and as substitutes for markers. Another approach of cause is to find some variation of structure from motion method which is fast and works for mobile. Some variation of bundle adjustment algorithm looks most promising to me. PS PTAM tracker, which is ported to iPhone, use yet another approach – instead of using bundle adjustment for each frame, bundle adjustment is running in the separate thread asynchronously, and more simple method used for frame to frame tracking. Marker-based AR application and games could be viable. Blair MacIntyre written in his blog that he consider markers for AR to be a “prop”: “As soon as your start requiring props, that makes the games less portable … a conundrum to be sure.” Whoever it could be that marker-based AR games/app are not actually so bad. From business point of view marker based apps and games can provide interesting opportunity – non-intrusive mobile advertising. Instead of pushing ad into the face of the user, on the screen, occupying precious screen real estate, ad or logo can be put on the marker itself. That way it remain both highly visible and non-annoying. Different ad bearing markers could be keyed to different content units, thus providing ads rotation. 20, November, 2008 Posted by mirror2image | Augmented Reality, Mobile	| Augmented Reality, fiduciary marker, Games, Mobile | Comments Off on Marker-based AR application and games could be viable.